Elizabeth Bashaba Cook was my third great grandmother on my father's side and Aaron Brown's wife (see Aaron Brown Part 1 and Part 2). Her age on the 1850 Sumter County Georgia census looks like it says "41" which would make her birth year 1809 and make her about 10 years old when her first child was born (see Aaron Brown, Part 1) . It more likely says "46" which would be more in line with what the 1860 Sumter County Georgia census and the 1870 Covington County Alabama census records indicate--around 1803  . The 1850 and 1860 Sumter County Georgia and 1880 Covington County Alabama census records say she was born in Georgia. The 1870 Covington County Alabama census record has ditto marks under the "SC" for Aaron as her place of birth. Several family trees on ancestry.com have Nathaniel Cook and Elizabeth Jordan as Elizabeth's parents, but so far, I haven't found anything to substantiate this. I wrote a letter last year to the Elbert County Historical Society in Elberton, Georgia, asking for information about Nathaniel Cook and Aaron Brown. The historical society forwarded my letter to the Elbert County Public Library. Among the information that the library sent me were copies of a couple of pages from a book titled Grandma Where Are You: Cook/Cooke Cousins of the South by Marie Kellogg Taylor. On page 461, Nathaniel Cook's wife is listed as Elizabeth, but no maiden name is given. Their children are Daniel, Joseph, James, John, Jordan, Jethy, Elizabeth, Unity, and Sarah. Jordan is the only child for whom wives (he had 3) and children are listed. Was Jordan the maiden name of Nathaniel's wife Elizabeth? Even if Nathaniel Cook turns out to not be Elizabeth Cook's father, I believe that there is certainly a close tie between the two families. Aaron Brown and Elizabeth Cook named one of their sons Jordan (see the list of their 15 children in Aaron Brown, Part 1), and as I mentioned in Aaron Brown, Part 2, their second son had the middle name of Nathaniel. Elizabeth was about 16 years old when she married Aaron Brown on March 21, 1819, in Elbert County Georgia . They were living near Nathaniel Cook in the 1820 Elbert County census, and it appears that they were living in Monroe County by 1830, as was Nathaniel (see Aaron Brown, Part 1). Jordan Cook, a child of Nathaniel, is listed in the 1840 Monroe County census on the previous page (his name is spelled Jourdan) . Daniel Cook is on the same 1840 Macon County census page as Aaron Brown . Could this be the Daniel Cook noted above as a child of Nathaniel Cook? Jordan Cook is in the 1850, 1860, and 1870 Sumter County census records [7, 8, 9]. This is the same county where Elizabeth and Aaron Brown were living as of the 1850 and 1860 censuses. By the 1870 census, Elizabeth and Aaron had moved to Covington County Alabama where their oldest son William was living . They may have been in Alabama earlier. A transcription of the Goodhope Primitive Baptist Church records on an Alabama genealogy website trackingyourroots.com notes that on June 8, 1867, "Bersheba Brown" was received by letter (http://www.trackingyourroots.com/data/goodhope.htm). This could be our Elizabeth Bashaba Cook Brown. The location of the church is given as County Highway 63, Section 1, Township 6N, Range 16E. The township and range are the same as that given in the 1870 Covington County census for Aaron and Elizabeth's location; however, the Section is not recorded. 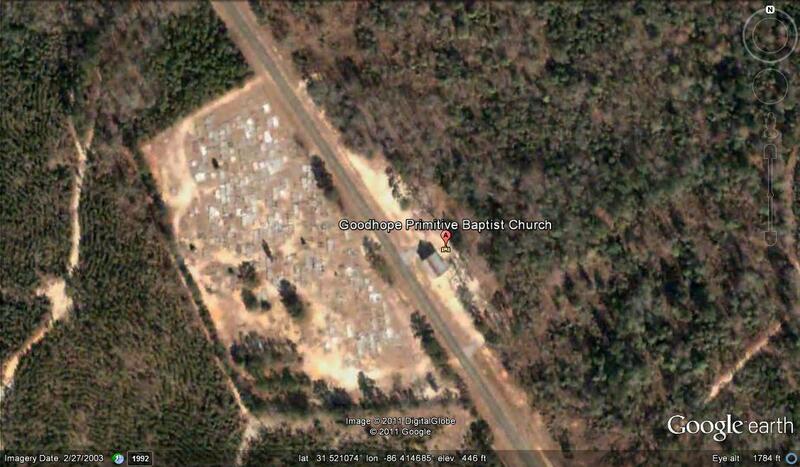 Below is a Google Earth image of the church and cemetery on County Highway 63 in northeastern Covington County. Goodhope Primitive Baptist Church and cemetery in Covington County Alabama on County Highway 63 where Elizabeth Bashaba Cook Brown may have been a member at one time (image from Google Earth). After Aaron died in 1872, Elizabeth and their adult daughter Caroline moved in with son William and his family; they are listed with him in the 1880 Covington County Alabama census . Elizabeth died on July 12, 1886. I found a listing of the graves in the Goodhope cemetery (http://www.prairiebluff.com/aacemetery/gdhopecem-aa.html), but no Browns are listed. The website notes that there are 71 unmarked graves. If Elizabeth was still living with William when she died, perhaps she is buried in a cemetery closer to where William lived. There are several churches near the land William owned in the middle of Covington County. The website trackingyourroots.com has a list of several of the cemeteries in Covington County and a list of the people buried in them. I haven't found Elizabeth or Aaron. There are several Brown family members listed as buried in the Salem Baptist Church cemetery. I thought I might see if I could get a copy of a death record for Elizabeth and/or Aaron. According to the Alabama Department of Archives and History (ADAH) website (http://www.archives.state.al.us/referenc/vital.html) death (and birth) certificates were not required by Alabama law until 1908. Before that time, some vital records were kept at the county level beginning around 1880, although some record keeping began before and after 1880. On their Local Government Records Microfilm database you can look up a given county to see what records are available. This is for ordering entire microfilm rolls (which I don't want). They do have some Covington County wills from 1882 to 1895. 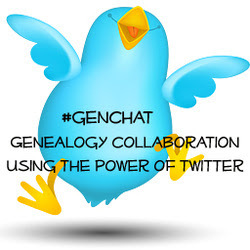 (They have land records, too.) Also on the database page is a link to a map that shows where and when courthouse fires have occurred across the state, thus the chance that all of the vital records for a given county up until the fire have been destroyed. Well, the courthouse in Covington County burned in 1895, but apparently there are some records for Covington per the ADAH website. I'd like to find a birth record for Elizabeth, and I'd like to find death records for both Elizabeth and Aaron and find out where they're buried. I'd also like to know what drew them from Elbert, to Monroe, to Macon, and to Sumter counties in Georgia. I presume they moved to Covington County Alabama because their son William was already there. I have more digging to do where Elizabeth and Aaron are concerned. I'm not done with their story. Ancestry.com. Year: 1850; Census Place: District 17, Sumter, Georgia; Roll: M432_82; Page: 175A; Image: 356. Ancestry.com. Year: 1860; Census Place: District 17, Sumter, Georgia; Roll: M653_136; Page: 475; Image: 486; Family History Library Film: 803136. Ancestry.com. Year: 1870; Census Place: Township 6 Range 16, Covington, Alabama; Roll: M593_11; Page: 484A; Image: 392; Family History Library Film: 545510. Ancestry.com. Georgia Marriages, 1699-1944 [database on-line]. Provo, UT, USA: Ancestry.com Operations Inc, 2004. Year: 1840; Census Place: District 634, Monroe, Georgia; Roll: 47; Page: 157; Image: 903; Family History Library Film: 0007045. Year: 1840; Census Place: , Macon, Georgia; Roll: 46; Page: 15; Image: 613; Family History Library Film: 0007045. Year: 1850; Census Place: District 26, Sumter, Georgia; Roll: M432_82; Page: 145A; Image: 296. Year: 1860; Census Place: Districts 26 and 27, Sumter, Georgia; Roll: M653_136; Page: 509; Image: 520; Family History Library Film: 803136. Year: 1870; Census Place: Militia District 884, Sumter, Georgia; Roll: M593_174; Page: 327B; Image: 659; Family History Library Film: 545673. Year: 1880; Census Place: Fairfield, Newberrys, Harts and Red Level, Covington, Alabama; Roll: 9; Family History Film: 1254009; Page: 302D; Enumeration District: 52; Image: 0611.